One of the most frequent question I am asked from guests is “What is the best Mansion in Newport?” Usually my answer is that all of the houses are different and appeal to everyone in their own way. While this is true, I think that the house with the most character and spirit is The Elms. The Breakers is the most impressive and the largest but it seems to have been primarily designed to throw huge parties. The Marble House was essentially built to one up the Breakers and it shows with it’s pure volume of Gold and Marble throughout the mansion. Lastly, although elegant, Rosecliff is used for weddings and other functions and it’s decor is often in a transistion phase setting up for these events. The Elms, which is suprisingly on the non water side of Bellevue Avenue was designed by Horace Trumbauer for Edward Julius Berwind. Mr. Berwind was born in Philadelphia in 1848, the son of German immigrants. At the young age of 17, he was appointed to the United States Naval Academy which was then located in Newport. After a 10 year career in the Navy, Berwin joined is brothers in the lucrative coal business. Soon after joining the famliy business, Mr. Berwin was appointed head of the New York office and grew the business to the largest coal supplier of the marine industry. The design of the Elms, lead by Horace Trumbauer, was based on an 18th century adaptation of the Chateau d’Asnieres near Paris. French interior decorators filled the house with enough period furniture, paintings, and tapestries to qualify The Elms as an instant museum. From the outside, The Elms seems to have only 2 stories but this was done on purpose to hide the staff’s quarters, kitchen and laundry. Not suprisingly, a coal fired heating system, which was way ahead of it’s time, was installed to protect the many valuable antiques and paintings inside. Coal was transported through an underground rail system to maintain the allure that the house ran itself by itself. Undoubtably, the most impressive aspect of The Elms is the grounds. Many theories abound as to why the Berwinds invested so much money into landscaping design but most likely it was done to compensate for the lack of ocean views. Upwards of $300,000 was spent to outfit the grounds and pay for the twelve gardeners needed to keep everything in tip top shape. The 10 acre park contains almost 40 species of trees and shrubs as well as many statues and fountains. The Berwinds were said to divide their time between the mansion and their steam yacht anchored in Newport Harbor. Mrs. Berwind died in 1922 and Mr. Berwind continued to work in New York and visit Newport on the weekends until he was 85. 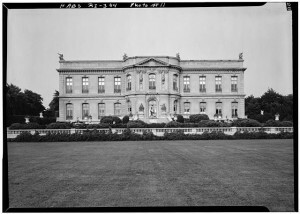 After passing at the age of 88 in 1936, Berwind’s sister assumed control of the house until 1961. 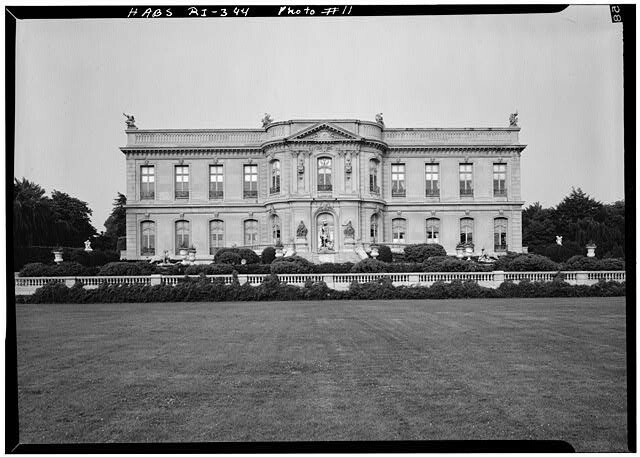 The Elms was saved from destruction by the Preservation Society of Newport County and the house was opened as a museum on August 20th, 1962. So, if you want to tour a Mansion ripe with spirit and character visit the Elms and be sure not to miss out on their wonderful behind the scenes tours where you can view the basement and the servants living quarters.